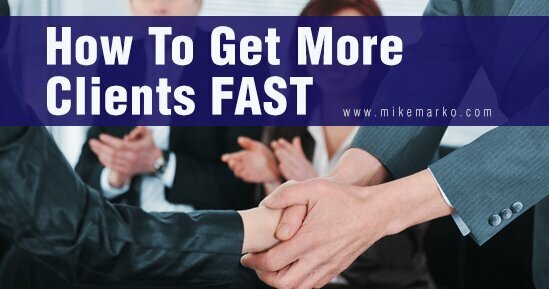 “23 Key Tips On How to Get More Clients FAST” written by Mike Marko. It’s a common question I get a lot from consultants and coaches. That’s because clients are the lifeblood of any consulting and coaching business. Yet many consultants and coaches struggle to get clients… So how can you get clients for your business? Today I’m going to help you. I’m going to share with you my top 31 tips on how to get more clients that you can start applying to your business today! So let’s get started and dive right in. By the way, you can download a pdf version of this blog post by clicking here. I’m sure you have some sort of social media presence, and if you haven’t started yet they get started now! That being said you need to make sure you first understand what message you want to portray to your social media. And then take that message and ramp it up! Make sure your audience knows you are the authority for XYZ on your social media platforms. To make some “filler” posts, I suggest doing some picture quotes (where you have a quote pertinent to your niche on a nice relevant picture). Be sure to present yourself on the key social media platforms: Facebook, Twitter, Instagram, and YouTube. By the way, if you have blog posts make sure you syndicate them by posting them on social media! 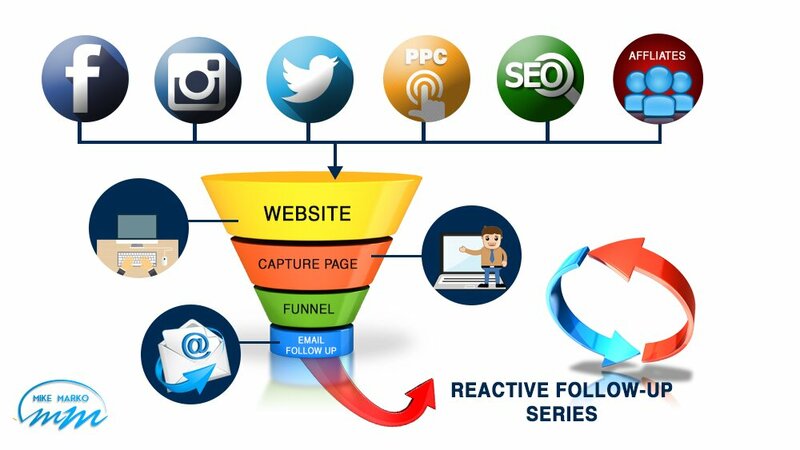 Generating leads is an important aspect of finding prospective clients. So it’s important to come up with a plan to reach them. I’ve talked about how to use capture pages to get leads in my blog post, The Key Tips To How To Make A Lead Capture Page. Capture pages are a great way to help you generate leads. If you want to know to get more clients, then “marketing funnel” is something you really need to learn about. But I recommend marketing funnels that are a lot more involved when you are promoting consulting or coaching services. You’re probably promoting a service worth hundreds if not thousands of dollars in value, and that is not a decision you clients will often make spontaneously. The marketing funnel helps to both educate and build trust in you. Learn more about effective marketing funnels in my blog post, How To Build A Dynamic Marketing Funnel. Now that you have the capture page and funnel in place, it’s time to start running ads. I love Facebook ads for scaling my business, but you can also use Twitter or Instagram if you don’t have the budget to run an effective Facebook ad campaign. Be sure to properly plan out your ad campaign using a Facebook Ad Grid before you run your Facebook Ads. The most effective Facebook marketing campaign puts substantial thought into your marketing hooks. This may seem like the most obvious way to get more clients… but it really isn’t to most. In fact, for the first six months of consulting, I actually forgot to ask for referrals. How are things going? I really enjoyed working with you on your project. How’s it going now? By the way, I’m looking for new clients to work with. Can you connect me with at least two people in your network that can use my services right now? Partnering with an agency is great if you are looking for how to get more clients. 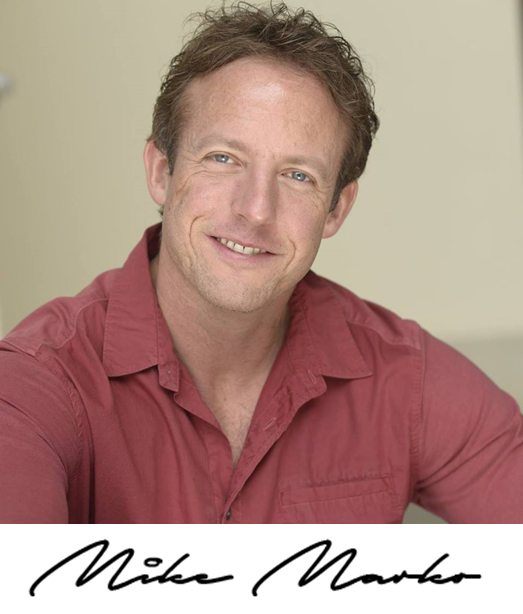 I’ve used this strategy several times to help build up my client base, and experience in a niche. They don’t have the available skills or expertise. Normally when an agency turns down a potential client they refer the client to someone in their network. That’s where you come in. I recommend emailing a dozen or so agencies with a personalized email to partner or to take up any work they pass up on. You may get responses from half, and then you can setup phone calls to work out details. Let’s face it… blogging is an amazing way to build relationships with your potential and present clients. My personal blog gets TONS of traffic every day. Now you won’t get your blog to suddenly start driving traffic to your business… it takes time. I had a mentor years ago point out to me that it takes 400-700 blog posts before a blog really starts working for you organically (through Google search, etc). That’s right… I’m not going to sugar coat anything. That’s a LOT of work. But it starts with one simple blog post… and then another… and another… and before you know it. 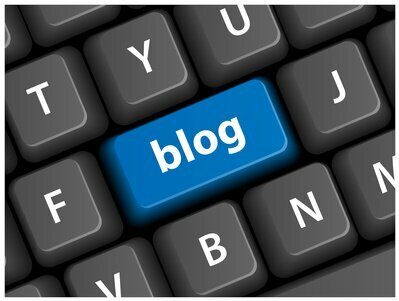 Blog’s are also great to help convert traffic into sales. They help build up trust in your skills as you demonstrate you are an authority in your niche. I cover some of the blogging fundamentals in my blog post, How to Get Leads With A Blog. Don’t delay… the blog will end up being your most valuable resource if you plan on being in business long term. Now while I said that it takes a ton of blogs to really get your blog profitable, you can actually speed that process up by guest blogging. Guest blogs are a way to borrow traffic from more established blogs and get their readers to learn about your “kung fu”, or in other words, you establish yourself as an authority on someone else’s blog. Find blogs that your prospective clients read, and ask to guest post on them. 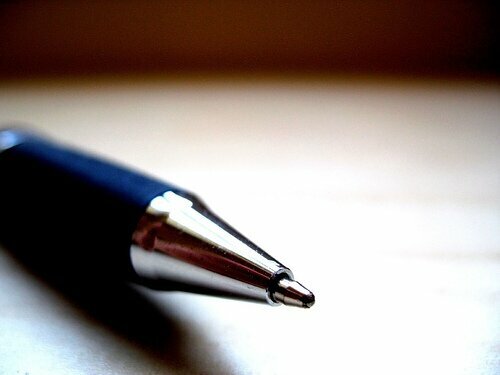 You should be able to write about topics that fit the niche of the blog. And be sure to write something that gives away tons of value. Alltop is a great place to start finding popular blogs in your industry. I’m sure you already have a “Contact Us” form on your website… but that’s usually only used by people ready to hire now. Most of the time potential clients may only browse your website then leave without even contacting you. That’s why it’s important to give lead magnets like PDF’s or checklists in exchange for their email. You can later put these leads through the marketing campaign to help convert them into clients. I recommend Lead Pages to capture leads. I mean those clients that heard you offer and said “no”. Don’t give up on those old clients. I will put them on a follow-up campaign on my calendar where I touch bases with them every 1-3 months and see how their project is going. This tactic is great for showing that you care about the client. It also helps keep you on their radar in case the opportunity to together opens up again. I’ve gotten a lot of business using this approach. Don’t just sit behind your computer all week long… plan to go to a meetup or conference, or other places where your prospective clients may be hanging out. I wished I had started this from day one because not only may you pick up a nugget or two of information, but you can network to find new clients. You can also network online using platforms like LinkedIn. Make sure your LinkedIn profile is up-to-date, informative, and include examples of your work. I recommend sharing your blog posts, website, and anything else that helps promote you. I’m sure you are already using job boards. You should go ahead and bookmark the following resources. These boards include design, development, marketing, copywriting, and miscellaneous jobs. The work ranges from remote, full-time, part-time, contract, consulting, etc… so there’s plenty to choose from. A long-term strategy to when you are looking for how to get more clients is to offer free strategy sessions. It can be a great tactic to offer 60-min free strategy sessions where you go over strategies to help them get new business. You don’t go into the nuts and bolts of the solution (otherwise they’ll feel they can just do things themselves) but instead, you go over the overall strategy on how to convert sales. I’ve used this tactic very effectively to bring in clients into my consulting business. Although this strategy takes time (to meet the clients either online or offline) it serves as a great way to generate new business. 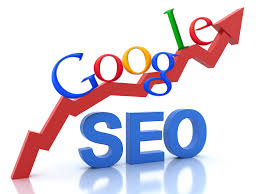 Search Engine Optimization (SEO) is a great long term strategy to get targeted traffic to your company website. Now you won’t get results overnight, but when you combine SEO with blogging (see above) you’ll be creating a sound long term strategy to get more paying clients. For some more information on SEO check out this blog post: What is SEO Marketing – Search Engine Optimization. Browse through old email conversations with colleagues, connections, and people you’ve spoken with in the past that could be a fit for your consultancy. Follow up with them by asking what they’ve been up to and how you can help. Asking how you can help lowers resistance of someone versus asking if they would like to hire you for your services. It helps build up relationships. Plus if you go out of the way to help someone for free, they’ll likely return the favor and help you. You can then ask them to give you two people they believe would benefit from your services. You can write an eBook solving a problem of your target audience. You can then either give it away for free (to give away if they give their email to you in a capture page) or sell it on your website. You never know what you can find. It’s worth checking out. You can always create a course on Udemy. It will help you tap into a large audience of students and prospective clients. If you work from home, you may want to consider coworking at least once a week. Coworking spaces are great for meeting similar-minded individuals. You can then work your way further into your local community of professionals. You’ll build up strong relationships, and be a go-to consultant for people at the coworking space. You can also attend the meetings and events that the coworking space may host. You can find coworking spaces by Googling “coworking + your zip code”. If you are looking to land a new client, nothing gets their attention more than a handwritten letter. Find the person who is most likely to hire you. Write and send a letter that focuses on solving their problems. This strategy is also great for following up after meeting prospective clients. The letter adds a nice touch. I love using press releases to help get the message about services and to let people in the industry know about any major announcements you may have. There are several press release services. It’s also a service I offer my clients. If you’re replying to a job ad or cold emailing, or cold Facebook or Skype messaging, then it’s a good idea to be personal and stand out from the competition. When you sound like you are writing and messaging that person exclusively, and you’ve taken the time to learn things about them, you’ll be amazed how that personal touch will help you close more deals. You’ll certainly stand out from the pack. Business cards can be a very effective marketing tool… if done right. Remember that your business card is your first “billboard” or “ad” that most people will see from you. Make sure that it is easy to read, stand out, and looks of quality. I’ve just listed 23 different ways on how to get more clients for your consulting or coaching business. These are some of the best strategies to help you land more clients in your business. Pick at least three strategies and get started right away! Be sure to download a pdf reference sheet of this blog post by clicking here.